Hey friends! 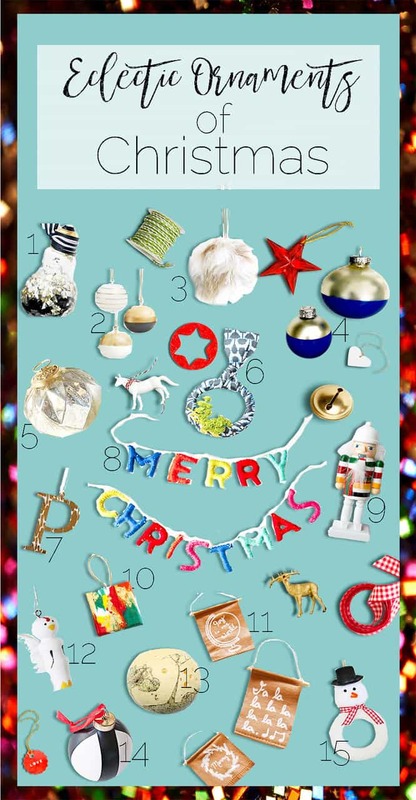 If you’re new here and came via the Eclectic Ornaments of Christmas blog hop then welcome! If you’re a regular, here’s the scoop: Today I’m participating in an “Eclectic Ornament” blog hop with 14 other talented bloggers! 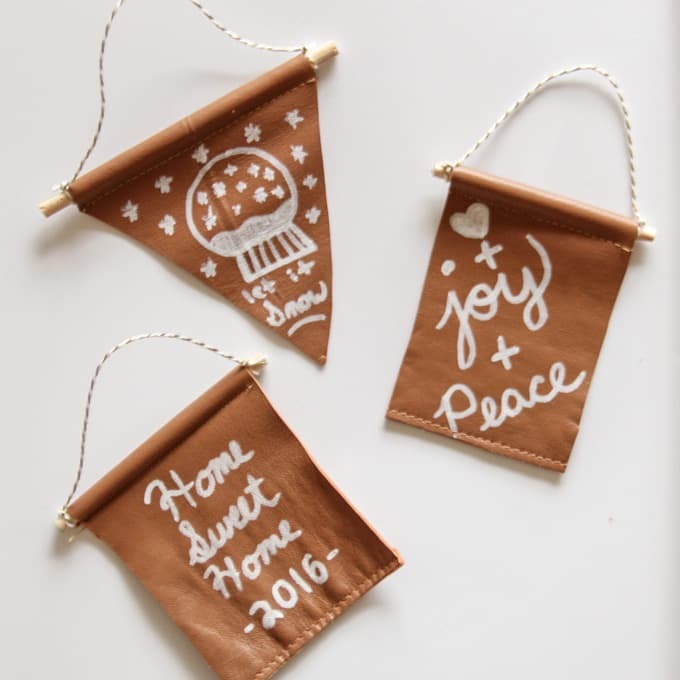 For my ornament I decided to create these fun DIY leather banner ornaments. It all started when I couldn’t find any cheap leather, but instead I found this leather coat for $4.99 at the Thrift store. I felt pretty guilty cutting up a decent leather coat, but hey, when a girl needs some leather you do what you have to right?! 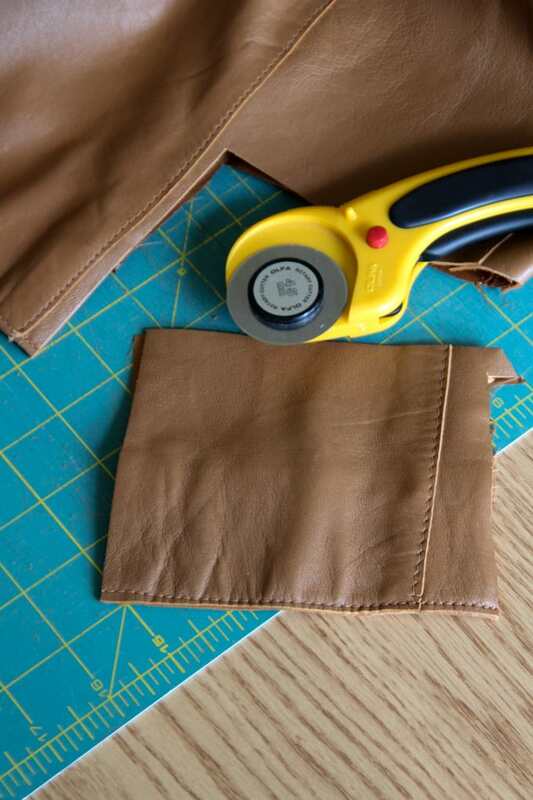 After cutting the leather into rectangles, I used my sewing machine to create a pocket for the dowel at the top of each ornament. Next I used a saw to cut the dowels slightly longer than each banner. 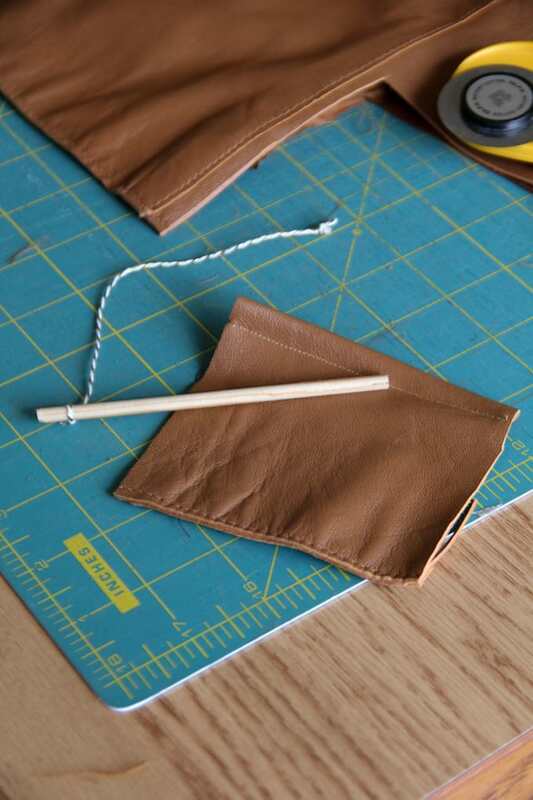 I also used some baker’s twine and attached it to each end of the dowel. 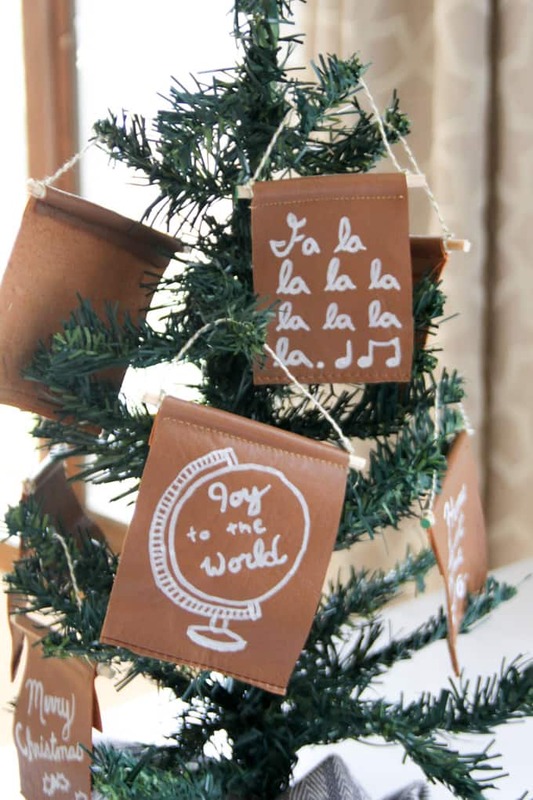 Then I used a white paint pen to write a simple message on each ornament. I am NOT an artist and this is where I struggled the most. After a few failed drawings, these nine ended up being my favorites. A legit artist could probably do something amazing with a paint pen, but I kept mine nice and simple. 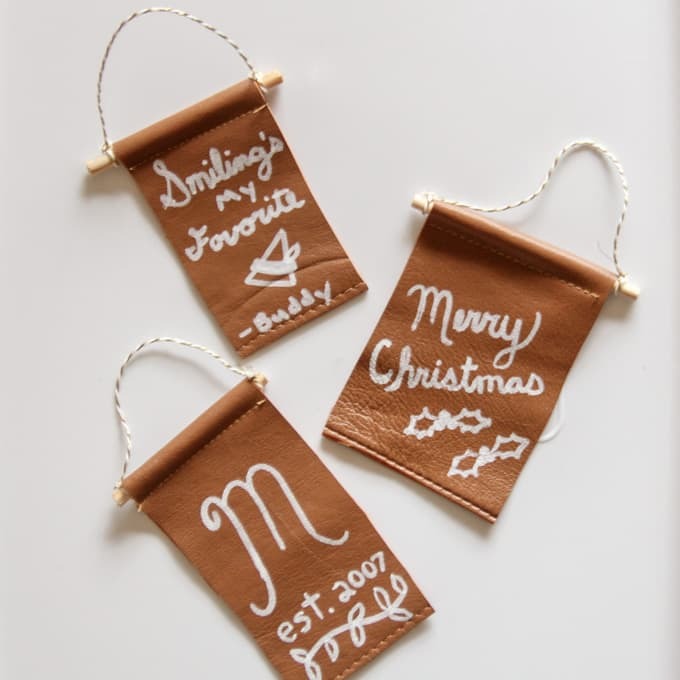 These could be perfect for any type of personalized ornament. A first home, a baby, a marriage, anything that you’d like to personalize with a name or the year. Whenever we hang ornaments, the handmade ones always hold the most memories. 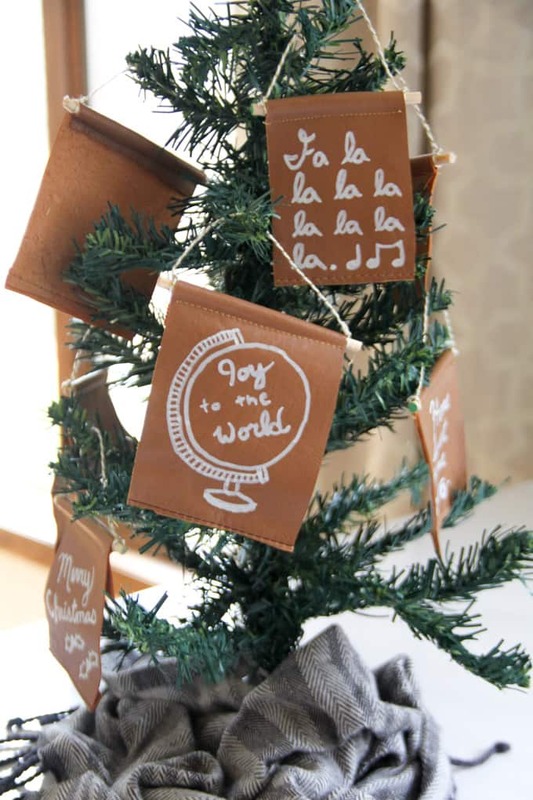 I’m thinking that I’m going to attach these to our gifts this year and use them as ornament gift tags. 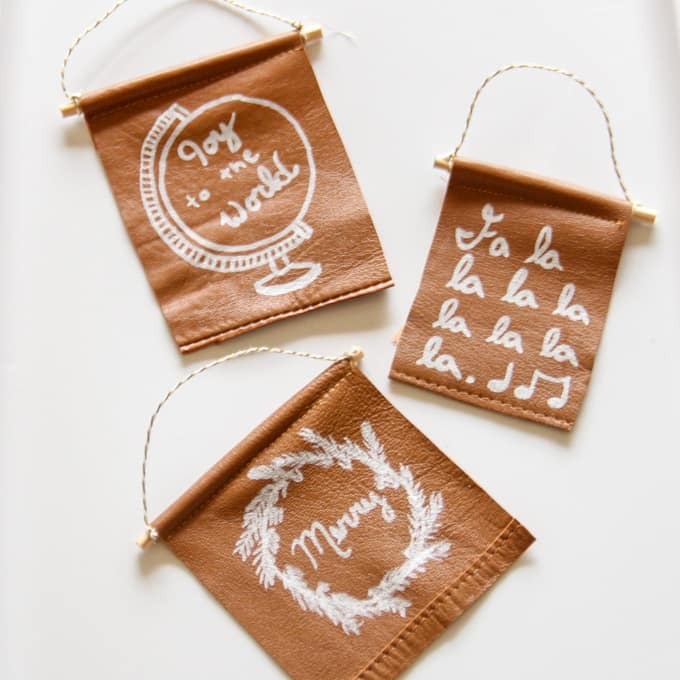 So if you’re looking for a simple DIY ornament idea, these are as cheap as the cheapest leather coat you can find! 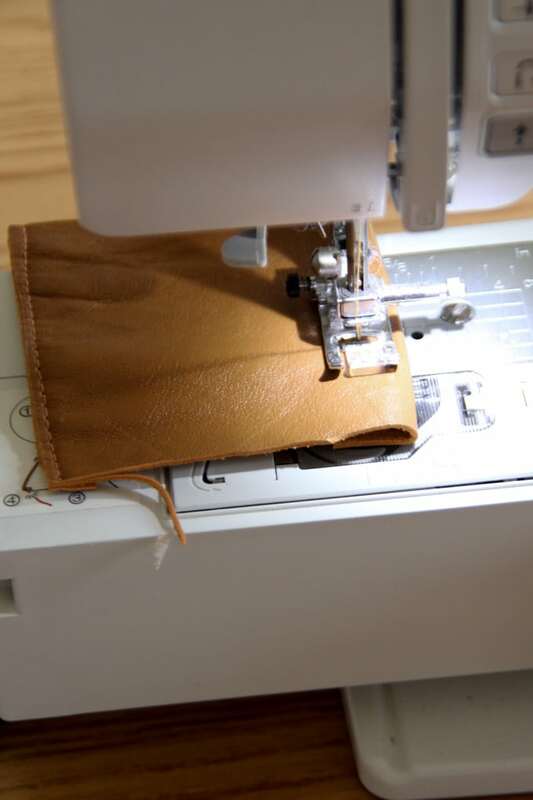 They could also be made with different types of fabric too! I just loved the look of the leather. 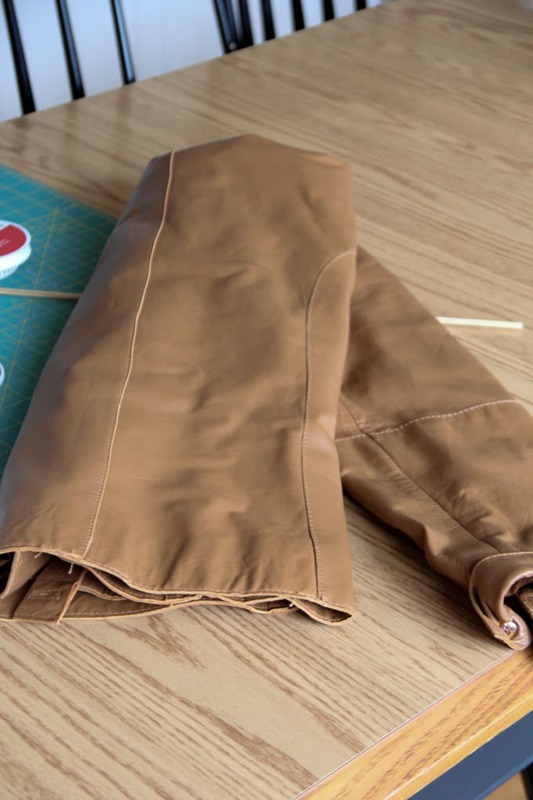 The best part is that I only used about 1/3 of the jacket on these, which means you’re going to have a bunch of leather projects coming your way! Thank you so much for stopping by today. 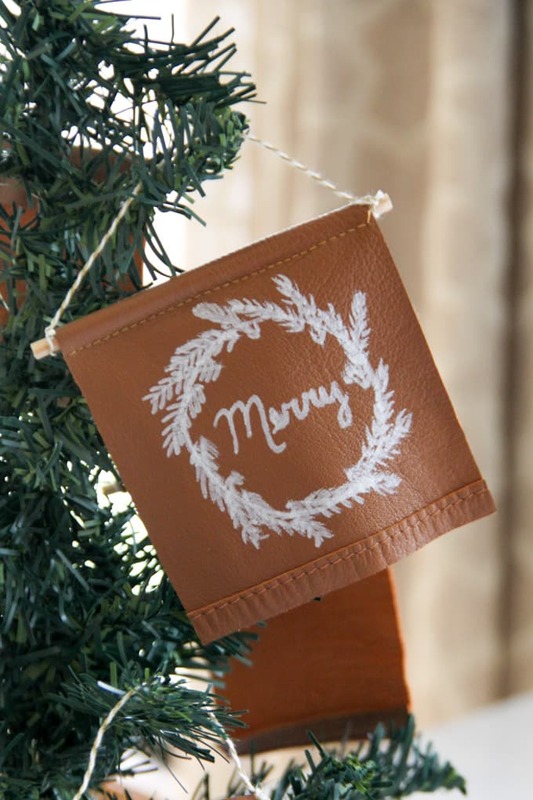 Hopefully you love making your own DIY leather ornament as much as I did! 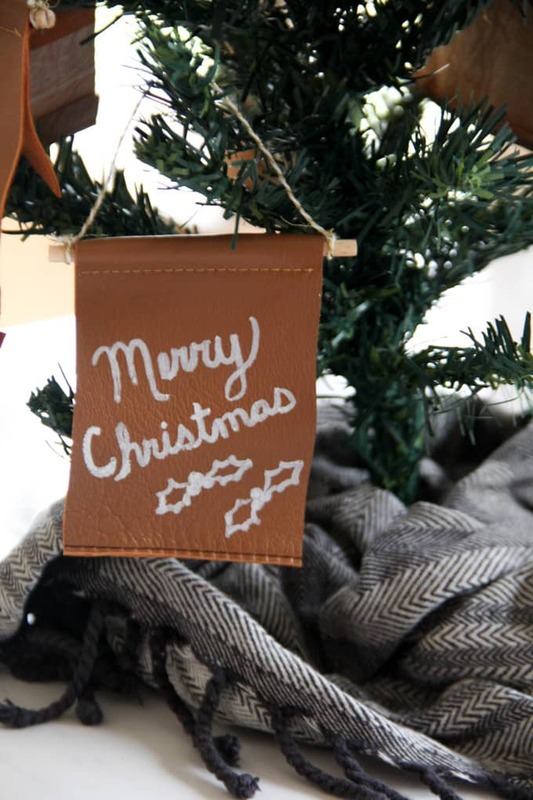 Make sure you check out some of the other amazing ornaments from this talented group of bloggers! 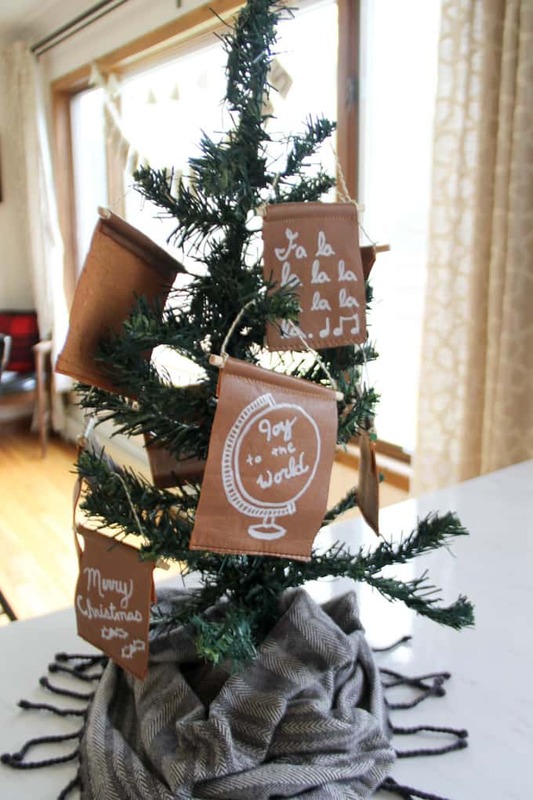 This is SUPER cute and what a great way to use scrap leather? Love this! Thanks! I’m glad no one hated that I cut up a nice coat! I’ve still got plenty left for my next project too! These look so luxe and fancy! 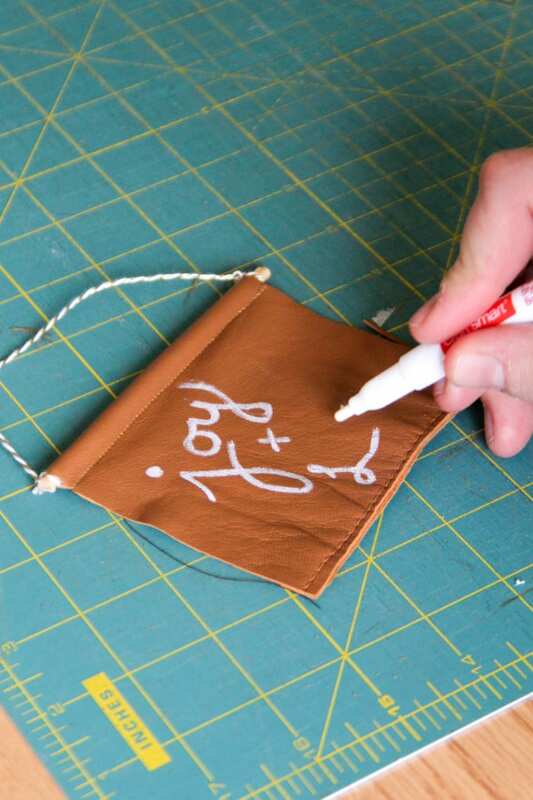 Great for a DIY gift, too. Aw thank you Monica! We’re going to be giving a bunch as gifts!